Chief Minister Virbhadra Singh said that semester system being introduced in the Colleges of Himachal Pradesh under Rashtriya Uchtar Shiksha Abhiyan (RUSA) aims at improving education standards. He said that semester system keeps students busy and update with the studies which is being followed the best colleges and universities throughout the world. Virbhadra Singh while presiding over State level “Samman Samaroh” of National Students Union of India (NSUI) at H.P. University, Shimla here today said that State Congress led Governments in the State had always accorded top priority to the education. Chief Minister felicitated the NSUI for splendid victory at recent held SCA election in the State. He said that with this win of NSUI another chapter had been added to the congress followership and it had re-imposed the students’ faith in congress ideology. He said that congress first won the Vidhan Shabha election in the State then Lok Sabha by- poll by huge margin and now NSUI had emerged as a biggest winner in the State. He said that it was made possible due to combined and concerted efforts of NSUI organisation, its office bearers, members and other leaders of youth congress. Virbhadra Singh said that NSUI should come upto the expectations of the students and strive hard to maintain academic atmosphere in all the colleges and universities of the State. He underlined the need of discipline and non violence and said that students should incorporate good moral values to become responsible citizen. Chief Minister said that State Government would not tolerate violence and other unlawful activities in all colleges and universities including private institutions. He said that lawbreakers would be dealt sternly and no students or student organisations would be allowed to vitiate the academic atmosphere. He said that main aim of students should be to get best education in order to become successful person. 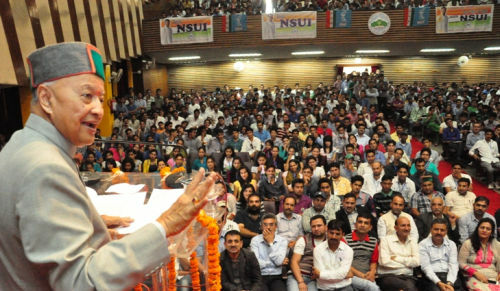 Virbhadra Singh said that NSUI should work towards inculcating spirit of nationalism and moral values among the students. He also called upon teachers and administrators to develop ideal education environment in their institutions. He said that student election has its own importance as through these many leaders have come to the main stream politics. Chief Minister said that General Lok Sabha elections would be held in next year and congress party aims to win all four Lok Sabha seats in the State for which its students wing NUSI can play a major role. He said that certain vested powers wanted mislead the people on the name of region, religion, caste, creed and culture which needs to be averted. He said that congress party always fought for unity in diversity and firmly believes in nationalism. Virbhadra Singh congratulated newly elected body of non teaching staff of HPU which had won six seats out of seven recently. Earlier, Chief Minister and other leaders paid floral tributes at the portrait of NSUI youth leader Nasir Khan. Himachal Pradesh Congress Committee President Sukhvinder Singh Sukhu said that he came through students’ politics and presently has the honour of holding the post of HPCC President of 125 years old party. He said that he remained the President of College SCA, NSUI and Youth Congress of the State. He said that congress has ideology of love, unity, nationalism and sacrifice. He said that congress leaders and formers Prime Ministers Indira Gandhi, Rajiv Gandhi and former Chief Minister of Punjab Beant Singh sacrificed their lives fighting against terrorism. Sukhu said that Congress Vice President Rahul Gandhi became youth icon of the nation due to his simplicity and affection for the poor and downtrodden. He said that NSUI bagged first position in the State due to collective efforts of all the organisations and leaders of the Congress. He said that NSUI next aim should be to win all SCA seats in H.P. University. NSUI National President Rohit Chaudhry complimented the NSUI for their victory in recent held SCA elections in the State. He said that today the life was being changing and the thinking of students was also changing accordingly. He asked the State NSUI leaders to adopt to change and win the confidence of students’ community through their hard work. He said that NSUI student leaders who could not won election this time does not felt disheartened but instead work with more vigour as many students had voted in their favour. He said that all the student leaders who fought election under the banner of NSUI were the face of our student organisation so they should act accordingly. Himachal Pradesh Sports, Culture and Environment Association President Vikarmaditya Singh said that NSUI has emerged biggest students’ organisation by winning more than 200 seats of SCA. He said that in 45 colleges NSUI made clean sweep whereas its 57 Presidents have won. He called upon the leaders of NSUI to work whole heartedly for strengthening the organisation in future. He said that NSUI and another youth wings of Congress played a major role in recent held Mandi Lok Sabha by-poll. State NSUI President Yadupati Thakur welcomed the Chief Minister and other leaders on the occasion. Urban Development Minister Sudhir Sharma, Chief Parliamentary secretaries Jagjivan Pal and Inder Dutt Lakhanpal, MLAs Ravi Thakur, Anirudh Singh and Bamber Thakur, Chairman H.P. State Co-Operative Bank Harsh Mahajan, Vice Chairman H.P. Forest Corporation Kewal Singh Pathania, V.C. HPU Prof. A.D.N. Bajpayee, Member Executive Council Harish Janartha and Chandershekhar, Chairman APMC Shimla-Kinnaur Mahender Stan and Chairman APMC Kullu & Lahaul Spiti Y.K. Mishra, Deputy Commissioner Shimla Dinesh Malhotra, S.P. Abhishek Dullar, Registrar HPU Mohan Jharta, General Secretaries All India NSUI Nikhil Diwedi and Nigam Bhandari, teaching and non teaching staff and students in large numbers were present on the occasion.